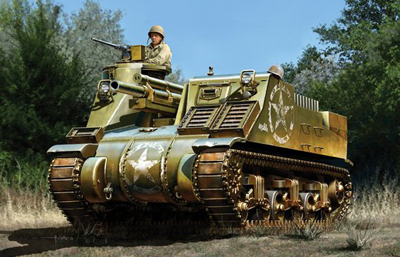 1/35 US M7 Priest Early Production Discounts Apply ! DRA6627 - 1/35 US M7 Priest Early Production Model - Smart Kit. Dragon's new 1/35 scale kit of the M7 Priest depicts an Early-Production type. It builds on the popular success of the Mid-Production kit (Item No.6637), and it features correct characteristics such as the howitzer (with an aluminum barrel featuring delicate rifling), ammunition stowage, transmission cover and M3-type bogie suspension. Among the many newly tooled parts are the side-armor plates for the hull, and new stowage bins on the rear of the hull. The interior of the main fighting compartment is particularly well done with full detail such as the 105mm M2 howitzer, stowed and ready-to-use ammunition rounds, intricate driver,s compartment and complete transmission. With the arrival of this kit, those modelers waiting for an Early-Production version of the M7 Priest will now be able to offer up a prayer of thanks! At the time of its entry into WWII, the USA relied heavily on the M3 Lee tank. Very early on it was realized there was a need for an armored and fully tracked self-propelled howitzer able to keep pace with armored formations. The resulting design, based on the M3 chassis and featuring an M2 105mm gun, was the 105mm Howitzer Motor Carriage M7. In British service it was, due to the .50-cal machine gun mounted in a prominent pulpit-like structure, called the Priest. Production of the 22.97-tonne vehicle commenced in April 1942, and a total of 2,814 M7s were eventually built. Early M7 Priests served with both the US Army and the British in North Africa and the Mediterranean. Each US armored division featured three battalions of the successful M7.